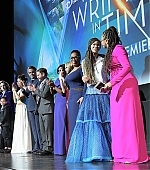 A few days ago, Gugu and her A Wrinkle of Time attended the world premiere of the movie in Los Angeles. Gugu looked beautiful in a Vionnet dress. I just wish her hair team would do something more natural with it as she has gorgeous hair. I’ve updated the gallery with over 200 photos of Gugu at the premiere.